Doesn’t time fly when you are enjoying yourself? I find it hard to believe that five months have elapsed since our Sulzer Type 2 model was launched at last year’s successful and enjoyable customer event in Tarporley, Cheshire. In the intervening time, there has hardly been time to draw breath and we have been truly amazed at the incredibly positive reaction to the model. Years of magazine experience has taught me that it is unusual for people to write in, but when they do it is usually to complain! Rarely do they communicate praise. This new venture has, however, turned that belief on its head and we have been inundated with complimentary letters and e-mails, something that appears to have echoed on social media and Internet forums. All the correspondence is appreciated and we hope to reproduce some of these kind comments on the website soon, to act as testimonials. So, rather than it being a one-way street, I decided a good way to keep in touch might be a regular letter or ‘blog’ of which this is, hopefully, the first entry of many. I’m not a big fan of impersonal Internet communications but I’m always eager to devour news, comment and opinion and I guess you are too. Some of the web diaries I used to follow or bookmarked for future reference tailed off very quickly and failed to be updated regularly. Others have one-picture or one-line entries that serve little purpose other to indicate the writer has better things to do. With a few notable exceptions, there’s not an awful lot out there that’s a good read. Hopefully, these people are spending most of their time modelling. Optimistically, I intend produce something on an approximately monthly cycle, but I know it is not going to be easy to maintain. Please send model comments, questions, prototype info or anything controversial that could act as a creative catalyst to slw@railexclusive.com. Alan Monk’s 24081 prepares to makes a run on Roundtrees Sidings thanks to an accommodating Lee Davis and team. Unfortunately route clearance hadn’t been checked and an errant point lever surgically removed a sand-pipe that instigated a layout-wide search. Being a very small organisation, high profile marketing and advertising campaigns were not originally part of our strategy, preferring to rely on word of mouth and the grapevine. 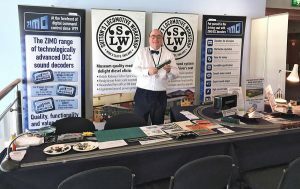 However, more by luck than judgement, we have been able to give the project additional visibility by attending a number of model railway shows with a simple demonstration stand. Without the pressure of having to make sales, I found that face-to-face interaction is the ideal way to showing off the many innovative features of the Class 24 to prospective customers. The prototypical brake and super-capacitor stay alive never fail to impress onlookers but the tour de force is always the DCC sound demonstration! We started in February with a last-minute appearance at the Rail Express Diesel & Electric Show in Telford, where I was amusingly placed directly across the aisle from a very slick-looking Bachmann stand. This ill-fated show (it is not going to be repeated) suffered from very poor attendance due to its lack of advertising. Nevertheless, my ‘economy’ single paste table and single-manned crew attracted some pretty knowledgeable diesel modellers, including several professional railwaymen and one part owner of the real D5054! Other than visitors to Tarporley, it was the first time people could see components close-up and touch (and hear) the Class 24 ‘in the flesh’ so to speak. The notable exception was at the earlier Doncaster show, where a SLW 24081 was running on the Hazelbank layout. 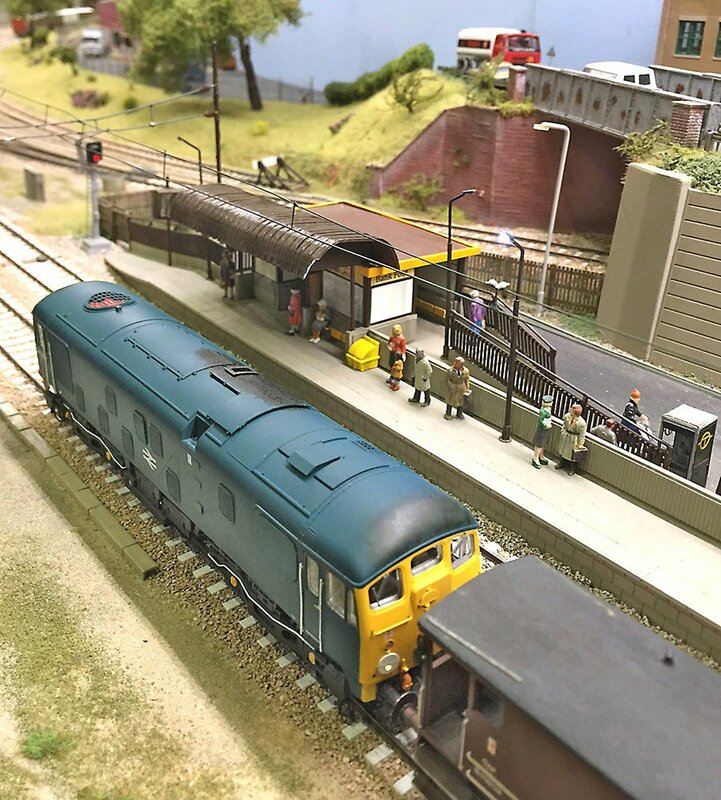 Respected BR blue modeller, and long term friend Alan Monk had brought his purchase along to Telford as part of his own DCC demo and duly gave it a run out on the Blyth & Tyne MRC’s EM gauge Roundtrees Sidings layout. Mark Tatlow, owner of Portchullin, also placed an order for a P4 gauge loco to run on his 1974 BR blue Highlands layout subsequently displaying his new purchase a couple of weeks later at the EMGS/Scalefour Society ‘101 not out’ event. A mid-March visit to the East Anglian Exhibition at Huntingdon, principally to assist with Paul Chetter’s ZIMO DCC sound demonstration, also allowed me to display the SLW Class 24 and it was not long before a visiting Jamie Mathlin showed me his weathered blue example that was being loaned to shunt Richard Slate’s Orchard Road TMD. Photographs were kindly provided to allow me to use them on publicity material as a way of illustrating how the model could be enhanced. It is has been fascinating to note how much attention this image has been accorded and we look forward to seeing more weathering jobs. The traditional Easter show at York Racecourse proved to be an extremely busy, but fruitful, long weekend – so much so that the voice was on its last legs by the third day. This show was a positive delight and my position high up on the second floor allowed me to overlook the lush green finishing straight. 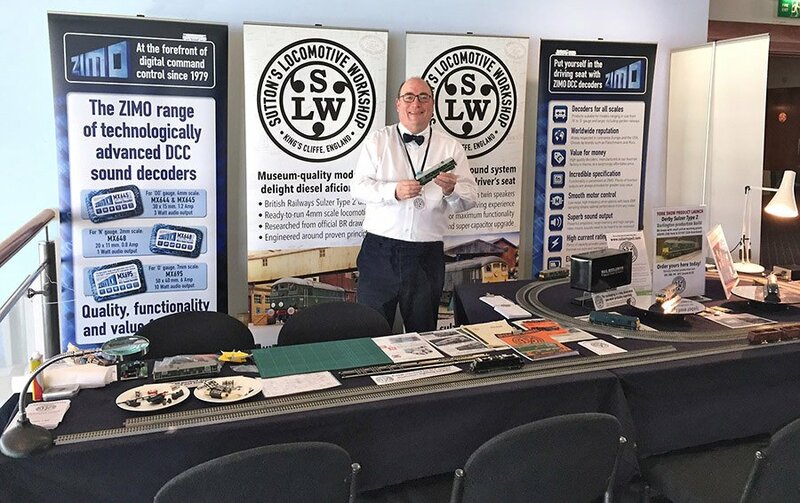 A last minute change to the floor plan allowed me to construct a couple of circuits of track specifically for the DCC sound demonstration and make the most of our new ‘no expense spared’ SLW backdrop banners. All this was fortuitous, especially as we had chosen to the event to reveal our newest livery version here – BR green with small yellow ends. The launch location was no coincidence since one of the two running numbers available, D5098, had actually been transferred to York shed in March 1963, exactly 53 years previous! The attendance of the show and level of interest in the Class 24 was fantastic and I had to rely on visiting friends or the friendly stewards to provide cover whilst I took rushed PNB (personal needs break). Apart from the youngsters who were fascinated by the horns and were given the chance to drive the locos (much to the nervousness of their Dads), it was the large number of EM & P4 modellers that was particularly noticeable. Or, maybe, I was just popular because I was giving away chocolate mini Easter eggs! Debut model D5098, with its historical York connections, stole the show. Another Yorkshire link was provided by a large contingent of visitors connected with the North Yorkshire Moors Railway, the preserved railway where we had recorded the authentic sounds. It appears that a lot of the diesel team, comprising management, drivers, fitters and apprentices have a fondness for the ‘Baby Sulzers’ and have purchased the SLW model. All were nodding approvingly as the display models spluttered up, down and around the test track. All this ‘feel good’ factor was topped off by a gentleman who spent about half an hour seated silently examining the models and listening intently to my patter. At the end he got up, nodded and shook me by the hand and said ‘proper job, it’s spot on’. He explained that he had been a driver based at Wigan Springs Branch in 1970s and was very familiar with the Type 2s. It’s feedback like this that makes all the hard work worthwhile. There were plenty of ‘finescale’ modellers attending York, and one of those was James Dickie, organiser of Scalefour North, which was to take place a few weeks later in Wakefield. 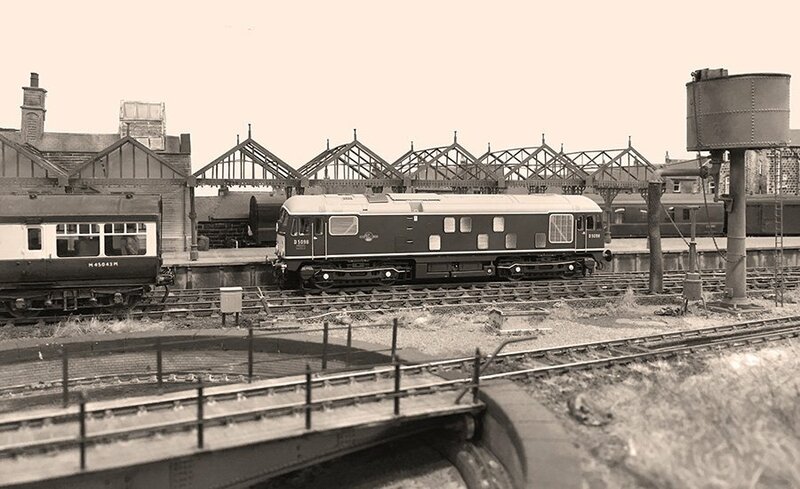 Here was the ideal chance to promote another ‘first’ on the Class 24 – the availability to purchase the model ‘ready-to-run’ in EM or P4 gauge. The whole point of providing this option is to encourage more people to ‘take the plunge’ and go for more accurate trackwork. Turn the clock black to the B&W railway reportage of the early-1960s. York allocated D5098 recently worked over the threatened Halifax High Level branch with the NER GM saloon. Having placed the saloon in the headshunt, whilst the top brass take lunch, the Type 2 is seen in the dilapidated Halifax King Cross platform providing a vivid contrast with the work-weary steam traction normally to be seen. Roll on modernisation (so says the man selling diesels)! Having met up with my club mates from Barrowmore MRG on Saturday evening for beer (The Ossett Brewery Tap) and curry (The Gandhi Spice) in nearby Ossett, my arrival on Sunday morning was delayed and I made it just as the doors opened. This was caused by a tremendous full English breakfast at my B&B, the landlady of which proceeded to tell me all about her late father who was very instrumental in the design and commissioning of the large Healey Mill Marshalling Yard, just down the road. I was also later to spend time chatting with one of the show team, ‘Dangerous Dave’, who provided me with some fantastic first-hand stories about working with the diesels at HM. The Sutton’s Locomotive Workshop roadshow will be making its next appearance at the Chatham Model Railway Exhibition on June 11th & 12th. As well as a proper retail sales stand this time, offering a surprise new item, a bevvy of BR blue Class 24 should be in action on the adjacent Mostyn layout. If you can come long it would be great to see you.